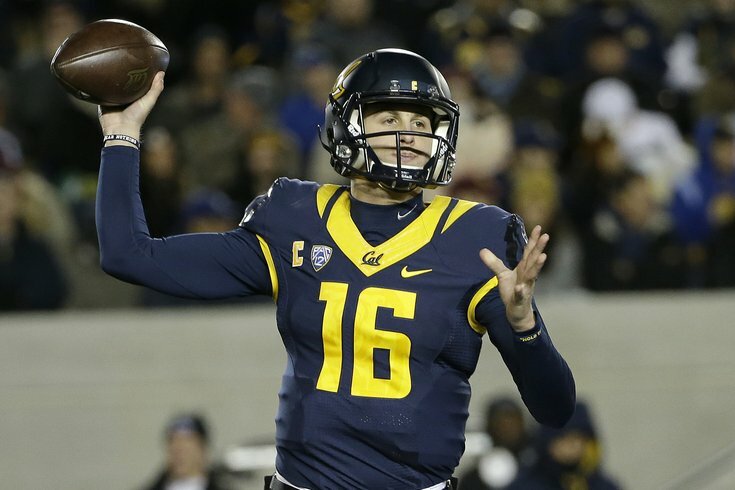 Cal's Jared Goff is one of three quarterbacks who could be drafted in the top half of the first round. INDIANAPOLIS – In regard to whether or not the Eagles should bring Sam Bradford back, that horse has been beaten to death and resurrected a few dozen times, so we won't get into all of that again here. The Eagles have all kinds of options. They can bring back Bradford. They can sign some kind of bridge quarterback to play in the short term while a rookie quarterback is brought up to speed. They can sign some other free agent reject as a reclamation project, such as Robert Griffin III. No matter what the Eagles plan to do at quarterback in 2016, drafting one would make sense in every scenario. In terms of what quarterbacks could interest the Eagles in the 2016 NFL Draft, the short answer is... all of them. Here are five at the top of the draft who could intrigue the Birds in the early rounds. Wentz is big, he has a good arm, a quick release, he's surprisingly athletic, and he has a good feel for the game. However, Wentz will encounter concerns about the level of competition he faced at North Dakota State. We did a thorough review of Wentz's overall game about a month ago. Wentz had his season interrupted by a broken bone in his wrist on his throwing arm, but he competed at the Senior Bowl and looked the part of a franchise quarterback. The Eagles have had extreme instability at the quarterback position since they (rightfully) traded Donovan McNabb, and they aren't winning jack until they get it fixed. Wentz could be a guy who may need a year before he's ready to play, but that patience could pay off in the form of long-term quarterback stability. Admittedly, it's been a while since I sat down and watched Goff play. We broke down Goff's game way back in July, which of course wouldn't include his 2015 season. Goff is really skinny, which is going to turn people off. To look at him, the perception is that he's going to get killed in the NFL. However, in the games I watched, he took some big shots and always seemed to pop right back up. He may have a frail-looking build by NFL standards, but he's tough. To look at Eli Manning, you would never guess he's one of the toughest guys in the NFL, but that's exactly what he is. From what I saw of Goff in 2014, he has better accuracy than Wentz or Paxton Lynch, but clearly not the same type of arm strength. I'd prefer my rookie prospect to have the latter. Lynch is a physical specimen who checks off all kinds of boxes in terms of what NFL teams are looking for in a quarterback. He has great size, a strong arm, touch, good mobility for his size, and a good feel for the game. The big knock on Lynch is his ability to hang in the pocket and deliver throws to his second or third progressions, or when he faces pressure. We took a thorough look at Lynch's skills back in November. Lynch has become the player most commonly linked to the Eagles in mock drafts. Hackenberg has a good arm and pro traits that you want from your quarterback. However, his production and game tape over the last two years has been really ugly. Some blame head coach James Franklin for running an ineffective vanilla offense. Others have put the blame on Penn State's porous offensive line. If the Eagles were to draft Hackenberg, it would be on pure projection. Cook was one of three players who declined their invites to the Senior Bowl, along with DE DeForest Buckner of Oregon and C Ryan Kelly of Alabama. A guy like Buckner is going to be a top-10 pick. He can really only hurt his value, so it makes sense for him to skip. As for Cook, there is a philosophical debate on missing practices. By not competing, it can be viewed as a signal that you think you're too good to compete there, or worse, that you're very aware of your flaws and think you could be exposed. In my opinion, Cook made a bad decision by skipping. Most evaluators have him well behind Goff, Lynch, and Wentz. Some even have him slotted behind Hackenberg. And there's a good reason why. Cook has a good enough arm, but he often struggled with accuracy at Michigan State. Not competing at the Senior Bowl is going to be a bright red flag for many teams. If he's available in the third round, then sure, go get him. But if I'm the Eagles I wouldn't touch him before that.